The cooler air of fall has arrived and many residents and visitors are looking for outdoor activities on theAlabama Gulf Coast. Biking is a popular land-based adventure that offers exercise and site seeing at the same time. 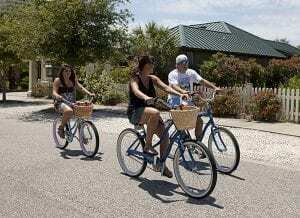 Get in touch with Mother Nature and have fun biking along the Gulf Shores and Orange Beach trails. Alabama State Parks are celebrating a milestone this year – its 75th anniversary. Celebrate by hopping on a bike and exploring miles of trails including the Hugh S. Branyon Backcountry Trail where hikers and riders can see marshes, sand dunes, swamps and creeks. The Backcountry Trails consist of 13.5 miles, six trails and seven distinct ecosystems. The trails run from Orange Beach to Gulf Shores in the wilderness part of the State Park. There you will find a biking friendly culture and peaceful natural surroundings that will keep you coming back for more. Biking is a great way to escape the big city lights and hustle and bustle so you can clear your thoughts and appreciate your surroundings. If you are visiting Fort Morgan Road, Coyote Crossing is a 6 mile trail that is an extension of the Backcountry Trail. Many visitors to the Gulf Coast do not want to have to haul a bicycle from home to the beach. We completely understand and so does Infinity Bicycles. Located in Orange Beach, they offer rentals and are conveniently located less than a mile from one of the entrances to the park. They also offer group rides every Saturday at 7:30 a.m. and 10:30 a.m. The early morning ride is theRoad Ride and is 30-35 miles in and around Orange Beach. The Leisure Ride is later and more casual through the Backcountry Trail. Biking is an adventure and regardless of the temperature outside, you should always pack enough water and keep safe by wearing a helmet. There are so many great trails located on the Alabama Coast that you should avoid the busy highways and take advantage of the nature trails. Ride safe and please leave us a comment on your biking tips.